There is no animal protein that can’t instantly be lifted to a higher place through the use of the holy trinity of ginger, garlic and chilli (close cousin of the holy duo of garlic and lemon of Chicken Roast Dinner fame). We cook with it liberally. So much so that the Tesco delivery man, who had initially been very apologetic to have brought £1.50 worth of loose raw ginger (that’s just under half a kilo bro, true story), suddenly found himself leaving the whole bag in our custody. This recipe has now become a midweek staple. It’s stupendously quick, very tasty and really very healthy. Throw this together with your favourite green salad which you should dress generously with a good dressing (try the one from the previous FNL, the Chicken, Goats Cheese and Avocado salad). This recipe is inspired by this BBC Good Food recipe. If you’re using dried puy lentils, cook these as per packet instructions but use vegetable stock and lemon slices for flavour. Mix the ginger, garlic, half of the red chilli, lime juice and zest and oil in a bowl and add the salmon, ensuring it gets a good coating of the marinade. Cover and refrigerate until you’re ready to fry it. 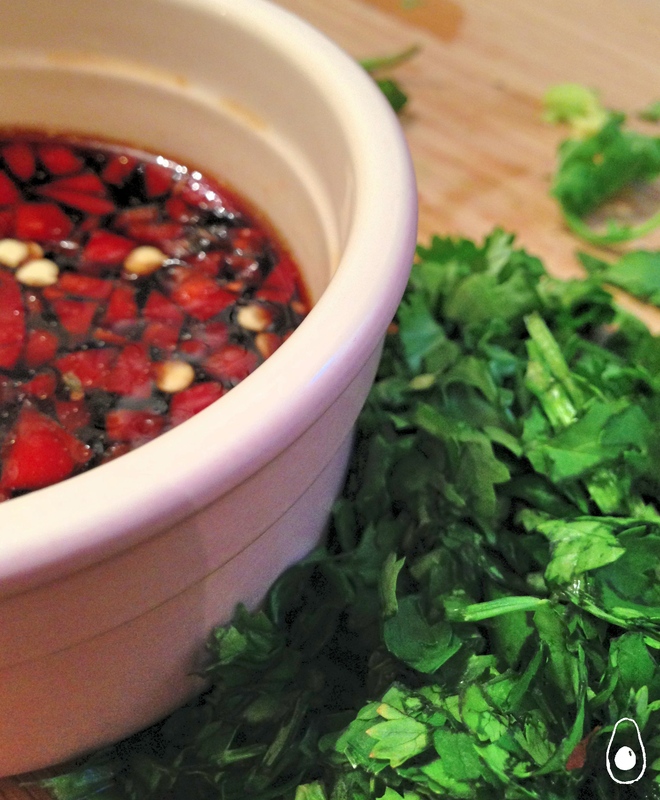 In a small ramekin, mix the remainder of the red chilli with the honey/agave nectar, rice wine vinegar and soy sauce. Set the dressing aside. Fry the salmon, skin down, in a hot and dry heavy based pan with about a quarter of its ginger/lime marinade (not too much as it burns easily). Leave the salmon undisturbed for 5 minutes then flip over and cook for a further 3-4 minutes, or until cooked (will vary depending on fillet thickness and your own preferences). When your salmon is about two minutes from finishing, add the remaining ginger/lime marinade to the pan with 2 teaspoons of the soy sauce dressing. Microwave the ready-cooked puy lentils as per packet instructions (variable depending on microwave but should be 1-2 minutes) and prepare your plates. 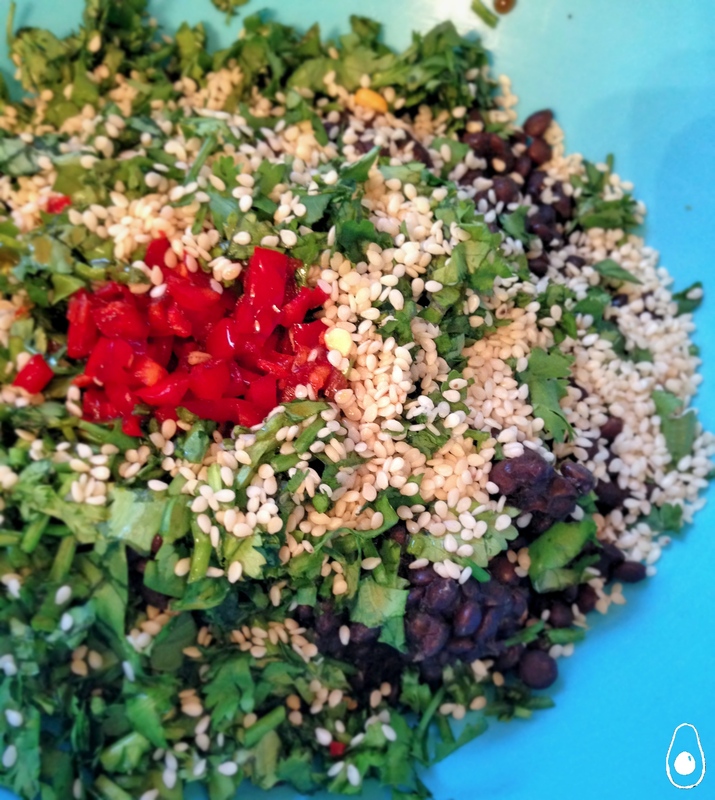 Mix lentils, coriander, sesame seeds and the remaining soy sauce dressing in a bowl. Spoon the lentils onto the plates and top with the cooked salmon fillets and distribute the juices as evenly as you can manage (you’ll want them all). Add your salad of choice and wash down with a lovely (large) glass of white wine. Good photography, yes. Unambigously delicious looking salmon. Thanks Eleanor – I only ever eat unambiguously delicious looking salmon, of course. What a great alternative to serving with rice. And I so love lentils. You order lentils through amazon?? I look forward to mixing garlic, ginger and lime and oil! I only use ginger for my curries. Great recipe! Thanks Julianna! Let me know how it goes when you do make it – I absolutely adore this recipe. That lime ginger combination sounds perfect for the salmon. Thanks Margot – coriander is definitely by go to herb. My rule of thumb is – if the dish can handle ginger, it can handle coriander. Thanks for stopping by! Ahh, all my favorite ingredients, I’ll definitely be bookmarking and trying this out. I so look forward to Fridays now, the Fiesta gives me so many amazing ideas – I love it! Thanks for stopping by! Love lentils with fish and your combo with ginger sounds fab! Lovely photos too. Happy fiesta Friday!! I can’t go on enough about these lentils! So delicious 🙂 Thanks for stopping by, Selma!